America is in the midst of a socialist moment. But is it even really socialist? Many on the left are exhilarated over the sudden prominence of self-proclaimed democratic socialist politicians (Bernie Sanders and Alexandria Ocasio-Cortez) and ideas (Medicare for all). And it's legitimately good to see the American left break free from the constraints it imposed on itself in the early 1990s, when, after a series of electoral defeats at the hands of a revivified Republican Party under Ronald Reagan, Democrats under Bill Clinton learned to moderate their hopes and accept a role as a party that fiddled at the edges of free-market capitalism while accepting its fundamental legitimacy as the organizing principle of political and social life. 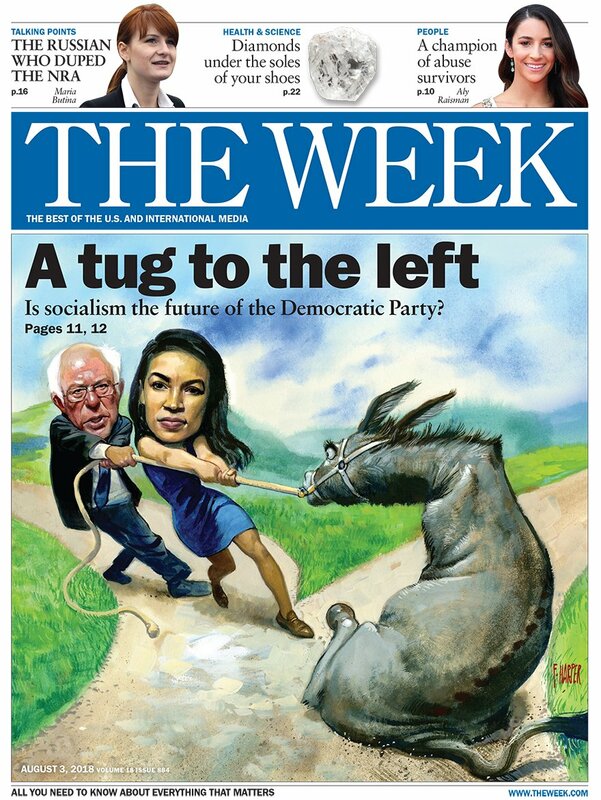 Still, is it accurate to describe the new agenda of the left, which is well-placed to take over the Democratic Party between now and the 2020 presidential election, as "socialist"? The answer is no, and it's important to understand why. The American left loves the label because our political spectrum as a whole sits several clicks to the right of where it's found in most of the countries of the Western world. With the economically libertarian Republicans calling themselves conservatives and the market-savvy policy tinkerers of the post-Bill Clinton, proudly centrist Democratic Party thinking of themselves as liberals or progressives, a bolder left feels the need to stake out ideological ground of its own. And that supposedly points toward "democratic socialism" because of the label's long history of attachment to parties found to the left of liberalism. But that doesn't mean the label makes sense. On the other hand, the policy agenda favored by nearly everyone on the American left resembles more than anything else the political, social, and economic arrangements that prevail in northern Europe, and especially in Denmark. Is Denmark a socialist country? If it is, then there is no meaningful distinction between socialism and liberal democracy — at least when the liberal democracy has a generous welfare state and a modestly regulated, mixed market economy. Given the political history of the United States, doesn't it make more sense for the left to understand itself, and to explain itself to voters, by making connections with the Democratic Party's own record of advocating for just such an expansive form of liberalism (rather than "socialism")? What the left really seems to want is a return to the administration of Franklin Delano Roosevelt — a New Deal 2.0 for the 21st century. Don't believe me? Consider the policy platform of the person who's suddenly become the symbolic leader of the so-called democratic socialist left: Alexandria Ocasio-Cortez, the 28-year-old candidate for Congress from New York City who won an upset primary victory in June against the fourth-ranking Democrat in the House. Ocasio-Cortez favors Medicare for all, gun control, campaign finance reform, tightened regulations on finance, access to higher education for all, significant cuts to defense spending, policies to make housing more affordable, and a federal jobs guarantee. That list is obviously more left-wing than what we've come to expect from the Democratic Party over the past three decades. Yet there's also nothing on it that goes beyond the policy agendas of mainstream left-leaning parties across the Western, liberal democratic world. Indeed, many of our allies already have such policies in place — and many center-right parties in those countries support them as well. That list is also perfectly continuous with the ambitions of the original New Deal, which was proposed, in part, to help forestall the emergence of a more extreme, anti-liberal form of politics from out of the misery of the Great Depression. The hope was that liberalism would save us from socialism — but also from fascism. Might a resurgent left accomplish the same today? Doing so wouldn't require or entail changing anything fundamental about the nature of American government. We would still be a liberal democracy, albeit a more generous one, resembling Canada or Germany somewhat more than we currently do, but not looking anything like the Soviet Union or present-day Venezuela. Which means that the left's agenda doesn't amount to "socialism." It's not only politically imprudent to say otherwise. It also happens to be untrue.